Image: Solar Frontier’s panels installed at Delta Electronics factory site in Thailand. Tokyo-based Solar Frontier K.K., the world’s largest provider of CIS solar energy solutions, and power supply and electronic component producer Delta Electronics (Thailand) PCL have announced the completion of four projects totaling 510kWp at the Delta Electronics factory site in the Bangpoo Industrial Estate near Bangkok. The projects were constructed by Thai solar power engineering, procurement & construction (EPC) specialist Energy Pro Corporation Ltd from July to the beginning of October. Solar Frontier’s CIS (copper indium selenium) thin-film solar panels have been installed on rooftops and carparks of two Delta factories. The four projects are expected to provide about 793MWh annually, and all power generation will be for self-consumption by Delta Electronics. The transformer-less Delta grid photovoltaic (PV) inverters installed are the PRI M50A and RPI-M20A series of products. The entire solar power solution is linked with Delta’s in-house developed software, which allows monitoring and controlling of the power consumption. Solar Frontier’s panels installed at Delta Electronics factory site in Thailand. 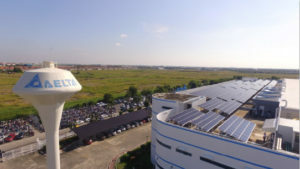 “Delta Electronics is planning to get the LEED (Leadership in Energy and Environmental Design) Certificate for all our factories in Thailand, and as Solar Frontier’s premium CIS solar panels are able to achieve excellent power output under strong sunlight and even during the rainy season, it makes them a reliable solution all-year round,” comments Hsieh Shen-yen, president of Delta Electronics (Thailand) PCL. “We have been providing inverters for Solar Frontier in Japan since 2015, and we are confident that the success of the four projects will further develop our business partnership with Solar Frontier in Thailand,” he adds. “Thailand aims to increase its installed solar power capacity to 6GW by 2036, and has great potential for solar power,” notes Solar Frontier’s executive officer Yuichi Kuroda. “Solar Frontier’s CIS solar panels generate more electricity (kilowatt-hours per kilowatt-peak) compared to crystalline silicon modules in real-world environments, and the panels’ high shadow tolerance means that they are efficient even during Bangkok’s 6-month rainy season,” he adds.